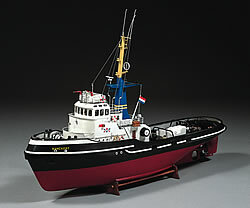 Billings Boats BIL516 BancKert-Ocean Tug 1/50 scale ABS hull! This vessel was built in 1965 at the N.V. Scheepswerven in Millingen, Holland, and called “Maasbank”. In September 1977 it was renamed “Banckert”. The Maasbank served for 12 years in the Western part of Holland. Length 32.75 m, breadth 7,85 m, draught 3,40 m. The engine yields 1800 HP.